If you have a UAN (Universal Account Number), checking your PF status is a quick and easy process. In this article we will show you three methods by which you can check your EPF balance quickly if you have your UAN. Actually the EPF savings are meant for your retirement. Provident fund help to employees to save a fraction of their salary every month so that they can use the same in an event that the employee is temporarily or no longer fit to work or at retirement. Checking your EPF balance often is a good practice. It helps you plan your savings and expenditures properly and prevents you from being burdened with debts and looming credit card bills. It also lets you know if you need a loan for emergency expenditures. When you apply for a loan, lenders often want to know if you can pay back. That’s when knowing and being able to easily access your EPF balance becomes essential. Before you go about checking your PF status, it is important to keep your UAN handy. If you do not have your UAN or are yet to generate it, you can still check your EPF balance online. Refer to this article to get more information on how you can obtain your EPF balance without a UAN. Following are the three methods by which you can obtain your EPF balance status with your UAN. For more information on UAN and how to generate and activate it, please check our other articles titled UAN Login, UAN Passbook, and UAN Status. There are times when you don’t have access to a laptop or computer. Or perhaps you are unable to connect to the internet. Checking your EPF balance on the go does not require you to have access to the internet. You can simply send an SMS or a missed call to obtain your EPF balance. Here’s how you can do this. Short Code SMS facility – Get your PF status by sending an SMS. Type EPFOHO UAN ENG and send it to 7738299899 from your UAN registered mobile number. You will receive an SMS that provides your EPF account information from EPFO, India. This SMS service is available in multiple Indian languages, including Hindi, Gujarati, Bengali, Punjabi, etc. To receive an SMS in Hindi, for example, send EPFOHO UAN HIN to the above number. Missed Call facility – Give a missed call at 01122901406. You will receive an SMS that provides your current EPF balance. Important: Both the above facilities require your UAN to be activated and linked to your bank account number, AADHAAR number, and PAN. This feature is only available if you have first activated your UAN number at the member e-Sewa portal of EPFO. To check your EPF balance, log in to the UAN Member portal. Then, enter your UAN, password, and the captcha code to sign in. 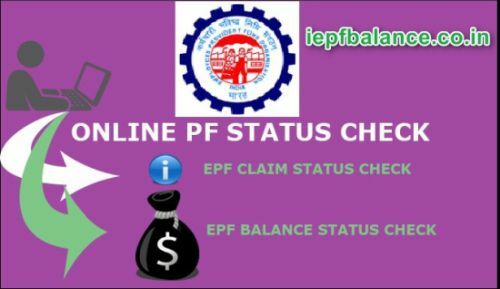 Once logged in you can access all your EPF account information, including the PF Status and recent transactions. The mobile app is part of EFPO’s m-Governance initiative aimed at helping members access and track their EPF account information on the go. The app is currently available only for the Android OS and can be downloaded from the EPFO’s website. In addition to PF status, you can view and download your EPF passbook for detailed account information for the last 7 months. 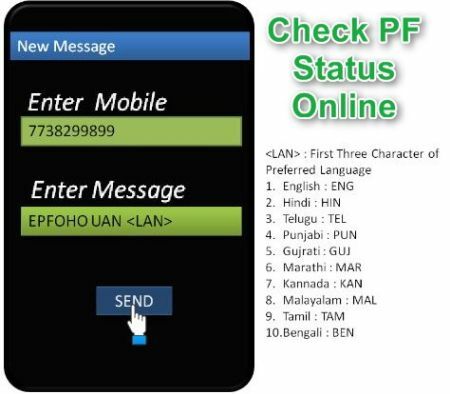 Here’s how you can check your PF status using the mobile app. On the welcome page of the app, click on MEMBER. On the next screen, click the balance/passbook tab. Next, enter your UAN and mobile number, and click Submit. The app will display your current EPF balance along with other personal details such as your name, date of birth, etc. If you need further information such as account activity, click the View Passbook option. As you can see, there are several options available to check your EPF balance. Such options are particularly useful when you’re travelling or when you don’t have access to a computer or an internet connection. All you need to do is send an SMS or give a missed call to receive your account information. The mobile app is another option that makes it easy to retrieve your PF status. Now, you can check your EPF balance from any place and at any time. If you like the above information on EPF, then share it with your friends and family members. Also, keep visiting eepfbalance frequently for more updates and information on your favourite retirement scheme. why not member portal open with password? I need to know my pf balance please. PLEASE SEND UPTODATE STATEMENT TO MY EMAIL ID. why not member portal open with password? I want to know my PF balance statement. I want to know my PF balance statement. Venkat, Contact the EPFO helpdesk. If you have a screenshot of the error, send it to them so they can see it. kindly release the website of epfo balance check .since it was from last 3-4 months back we cant able to know the pf status currently employee of our company variegating the pf status we are stick to speak with them .so requesting epfo office to needfull the requirement. Hello This Is Phil Burton please help in my activation an account operations an balance this is all very new to me but I think I get it! !